Hands-on labs for learning how to configure, instrument and troubleshoot Riverbed products and solutions. Riverbed Lab is a Virtual Sandbox Environment that Enables IT Engineers to Access Pre-built and Design Your Own Topologies for Experimenting with Deployment, Configuration, Instrumentation and Troubleshooting of Riverbed Products and Solutions. 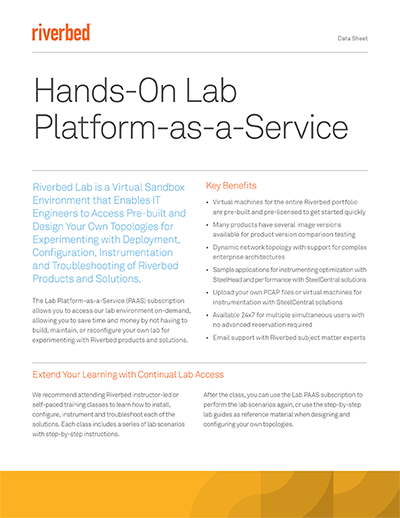 The Lab Platform-as-a-Service (PAAS) subscription allows you to access our lab environment on-demand, allowing you to save time and money by not having to build, maintain, or reconfigure your own lab for experimenting with Riverbed products and solutions. In addition, you can use the Lab PAAS subscription to continue your access to lab scenarios from any expired Riverbed instructor-led or self-paced training classes you have taken.